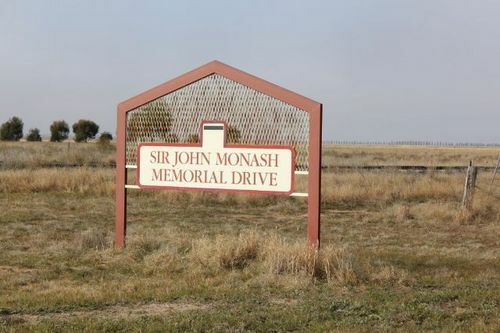 The Sir John Monash Memorial Drive commemorates the World War One military commander, Sir John Monash. Sir John Monash GCMG, KCB, VD (1865 – 1931) was a civil engineer and an Australian military commander of the First World War. He commanded the 13 Infantry Brigade before the war and then, shortly after its outbreak, became commander of the 4th Brigade in Egypt, with whom he took part in the Gallipoli campaign. In July 1916 he took charge of the newly raised 3rd Division in northwestern France and in May 1918 became commander of the Australian Corps, at the time the largest corps on the Western Front. The successful Allied attack at the Battle of Amiens on 8 August 1918, which expedited the end of the war, was planned by Monash and spearheaded by British forces including the Australian and Canadian Corps under Monash and Arthur Currie. Monash is considered one of the best Allied generals of the First World War and the most famous commander in Australian history. Jerilderie is the childhood home of Sir John Monash honoured military commander whose image adorns the Australian one hundred dollar note He attended and achieved dux at Jerilderie Public School and his name can be seen on the wall in the head office of Jerilderie Public School on the official record.